Like any proper celebration, your Easter family traditions always deserve the most fitting food. While other holidays may be prime cheese board season, Easter is a chance to build a brunch spread to rival them in both classic tastes and appearance. This pancake board features various toppings (butter, syrup, blueberries, strawberries, raspberries, bananas, and chocolate chips) with sides of bacon and eggs available for each person to customize their own plate. While you pour orange juice for the kids, don’t forget to serve up an Easter morning mimosa using bright, dry prosecco for your adult guests. Now that everyone is satisfied (especially Uncle-what’s-his-name already dozing on the couch), it’s time for activities. 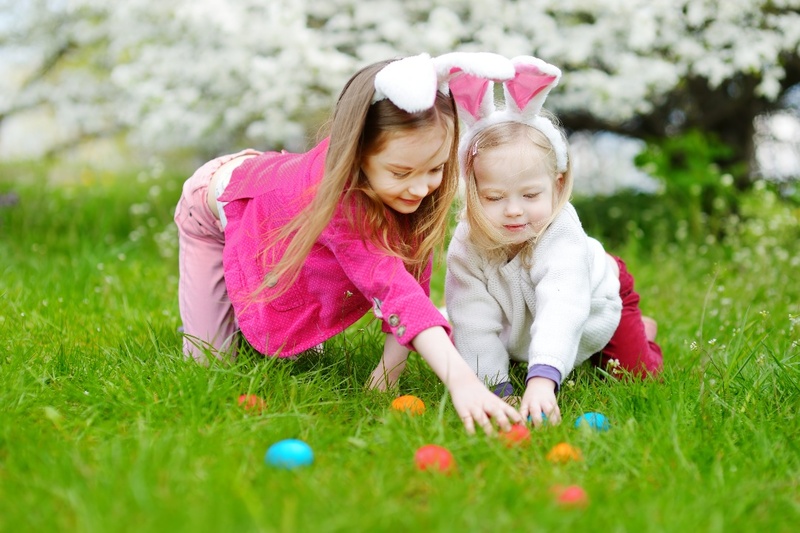 The classic tradition for kids never grows old: an Easter egg hunt. However, put a spin on it. Turn off the lights and draw the curtains throughout the house. Then, hide glow-in-the-dark Easter eggs that will light up your child’s face with delight. Who Says Easter Hunts Are Just for Kids? Bring on the Beer Basket! What about the adults? Plan an Easter beer hunt. Head to your nearest Haskell’s shop ahead of time to assemble personalized six-packs of beer or hard cider you know your family guests will love. Then, hide the individual bottles or cans around the backyard in especially tricky spots and see which adult can fill their six-pack first. Let the Eggcellent Games Begin! Looking for an option that's fun for the whole family? Organize an egg roll race or egg and spoon race. Focus and stamina are key to push an egg across the floor with their noses in the egg roll race. Balance and agility are required to carry an egg swiftly but carefully across the finish line. (Make the egg and spoon race more challenging by requiring players to hold the spoon in their mouth with their arms at their sides.) Either way, it’s bound to make onlookers cheer and laugh. Supply those onlookers with tasty refreshments, too, and they’ll be forever grateful. Some of our favorites for Easter are Fresh Peach Bellinis and Kentucky Mules. If they’re in the mood for wine, go with a fruity and minerally white Voltaire Vouvray, a crisp and bubbly Brut Rosé, or a red deep fruit and spice Rhone Blend from France. Before everyone parts ways, one final thing remains (besides brunch seconds): dessert. Kids will love a crazy twist on dessert. Use colorful Peeps marshmallows and chocolate from the Easter candy hunt to make Easter-themed s’mores. Adults won’t be able to resist a more, shall we say, mature offering like carrot cake with a tasty beverage. When it’s easy to reach for a bottle of wine, try a little different angle with a complex Pinot Noir. Alternatively, enjoy dessert with a smooth cream ale. If you’re feeling especially brave, opt for a double IPA that provides crisp yet rich hops with a strong backbone to play to the rich carrot cake and icing. Your new Easter family traditions just might become the yearly favorites everyone looks forward to each spring. Happy Easter!